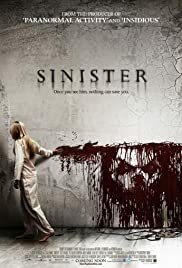 Q: Why was the name "Sinister" chosen for the movie? Q: Exactly how are all the murders related? Q: Is there any other movies similar to "Sinister"? It takes a lot to scare me... This did! Ever since the very first trailer came out I thought, "now this looks good!" However, some quite poor reviews came in so my dreams were shattered slightly. But then suddenly some rave reviews came out, even from my favourite critic, Chris Tookey who gave it 5 stars! My faith was suddenly re-installed and I was incredibly excited to see it. It didn't disappoint! With "The Cabin in the Woods" and now "Sinister", 2012 is restoring my faith in modern horror. It's a truly outstanding film that had me gripped for its entire 115 minutes. The film doesn't dawdle about too much either, it opens with a highly unsettling clip of found footage and then we get a beautiful swooping shot of a man and his family moving in to a new house. It's a standard set-up that we've even seen a few months ago in the surprisingly fun horror, "The Possession" but it's a clever one because we're mostly focused on our hero and in a sense that is what the film is about. His obsession with himself and trying to be re-ignite his fame after writing a highly successful debut true crime novel, followed by several duds. I was quite surprised as to how much exposition was given to the main character and it only makes the film even more compelling than it is. He's also played brilliantly by Ethan Hawke, who makes up for the lack of acting skills his wife possesses. It reminded me a little of "The Shining" with the egotistical novelist stumbling upon a certain ghostly history, and it certainly contains the same amount of creepy moments. Ethan stumbles upon the super 8 films quite quickly which I was surprised and pleased about, as all too often there's a belated exposition before anything remotely frightening happens. These super 8 films are masterpieces in themselves. It's a sort of car crash effect, as you don't really want to see them, but you can't stop watching. They're all incredibly creepy, unsettling and sinister (like what I did there?) They are also set-up perfectly with the horrible grainy picture, silence as well as highly unsettling music that all adds to the creepiness. All of them are engaging and compelling to watch. They're also very chilling and are sure to engrave themselves into your mind for a long time after the film has finished. From then on it's an intriguing and creepy mystery as more and more disturbing information is uncovered. It's also clever how it's unclear if some of what Ethan's seeing is actually real or not. Is he really hearing noises or is it just the whisky talking? I liked the whole family element as well, showing the protagonist as not just some perfect hero, but also as a flawed character. The whole strained relationship with his wife is a fantastic element on top of the central ghost story. Although the woman who plays her is incredibly wooden! There's a strong, unsettling atmosphere that underlies through the whole film. The demon man is also quite frightening and not too much is explained about him which certainly adds to scare factor. I've heard people call this a boring film and a bad film, but it's none of these things. It's a genuinely horrifying horror film with fantastic writing and directing. It's the type of film that gets under your skin and leaves its print in your mind for a long time after the credits have rolled. The ending is one of the most disturbing things I've ever seen in a horror film and I've seen many! "Sinister" is a ghost story of Japanese proportions. By the end, I was actually terrified and had chills all down my back, which is something that doesn't happen too often. I never get scared watching films, but after this and seeing "Noroi: The Curse" which also frightened me, I was starting to think that I was becoming soft! But then I thought no. These are just brilliantly scary films that are high on atmosphere and don't solely rely on jump scares like too many American ghost films. "Sinister" is one of the best horror films this year. It has a relentless sense of dread throughout and is also incredibly effective and compelling. I can't wait to see it again, and also can't urge you enough to go and see it for yourself! Although, I'd recommend a night light for when you sleep. 151 of 228 people found this review helpful. Was this review helpful to you?